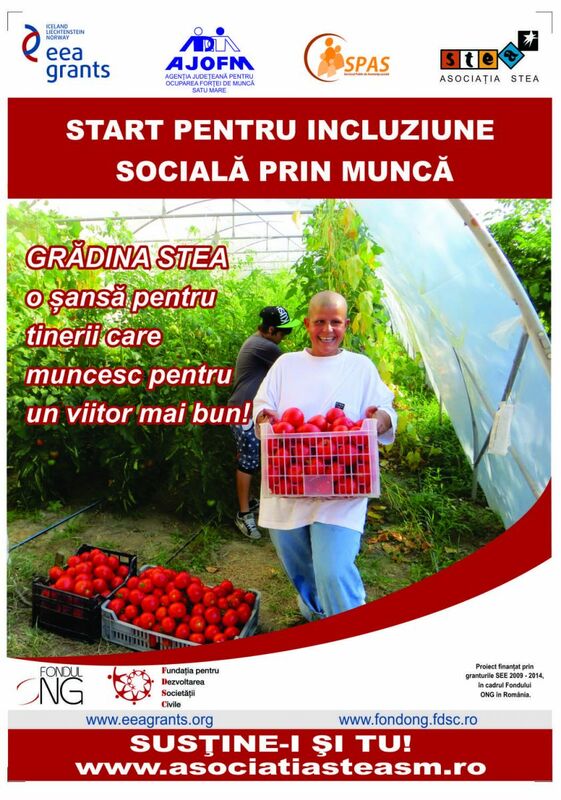 Stea Association, in partnership with the Social Public Services of Satu Mare and County Agency for Employment Satu Mare, implements within the period of 1 April 2014 – 30 April 2016, the project entitled „Start for social inclusion through work”. The project is funded EEA 2009 - 2014 grants, under the NGO Fund in Romania. The project budget is 69.125,54 Euro, of which 62.091,92 Euro represents the grant and 25,166.25 EUR is the contribution of Stea Association and its partners. The project aims to facilitate the socio-professional integration of young homeless by increasing their adaptability to the labor market. Objective 1: To develop life skills to 42 young homeless people within 24 months. Objective 2: To form the vocational skills of 42 young homeless people in the domain of gardening / agriculture throughout the project. Objective 3: To facilitate the development of socio-professional skills of 42 young homeless people by creating and developing horticultural therapy a program and individual counseling within 21 months. A vital aspect of our work with vulnerable people is to succeed increasing their self-esteem in order to be able to motivate themselves to make steps towards social integration. The project "Start for social inclusion through work" enable us more than ever to do so. We increased our organization’s capacity of providing basic and social services aiming to support social inclusion of homeless people through work. 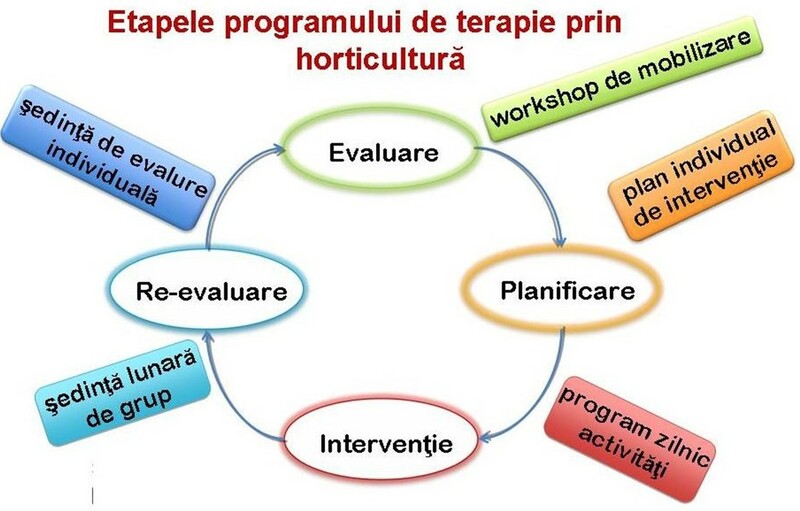 We have developed an innovative occupational therapy program through horticulture allowing a total of 47 direct beneficiaries to go through a work based experience in protected conditions which enabled them to develop their skills and coping mechanisms necessary for a good future integration into the labor market. Zoli is one of the first homeless adolescent that Stea Association’s volunteers met on the street in 2004. He was living with his family in an abandoned building on the shore of the Somes River after his parents lost their home. Zoli started consumption of drogues (inhaling glue) providing him mental refuge from the brutal reality in which he found himself. Despite our countless attempts to answer his requests of support, over the years, his situation has continued to worsen. In ten years, Zoli has become a drug addict and most of the time he failed to come in decent conditions even to receive basic services in our day center. In 2014 when we proposed him to participate in our gardening project with other young people living on the street in the same area, no one dared to believe that Zoli will be able to follow a program and get involved. But horticultural therapy had indeed the extraordinary power to determine him to change his life. 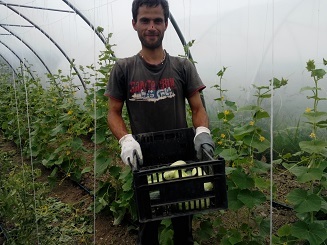 Thus, in the summer of 2015, Zoli has got to be one of the most responsible member of the gardening team, the first one arriving to work each morning, often even before social workers opened the center. „I was amazed to see Zoli as active, responsible and involved. Since he found its place within the gardening team, he is a changed man. At first I was skeptical to see the disappointment that he conveyed me the days when we didn’t have any planned practical activities in the garden of Curtuius, then I realized that for him that place became a space where he finds balance and manages to find a purpose in his life "- Mirela Molnar, social worker. Zoli is one of 47 young homeless people which since 2014, have made remarkable progress to develop their skills necessary to break the cycle of living on the street. The results of his work, the support he receives within the horticulture therapy program and the many opportunities he has had to value his capabilities, finally made him believe that he is able to work and build a better future for himself. 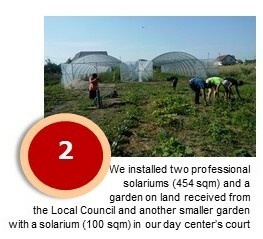 Through the Local Council of Satu Mare’s decision, in March 2015, Stea Association Star obtained the concession for 10 years a land of 1439 sqm located in Satu Mare for implementing the therapy horticulture program created within this project and to ensure its sustainability for supporting work based inclusion of marginalized people. In March 2016, 14 employees and volunteers of the Stea Association, have developed entrepreneurial skills participating in a training course that allowed to build the detailed planning of the project‘s sustainability activities. Since the summer of 2016, Stea Association is ready to launch a social economy activity based on production and marketing of vegetables produced within Stea’s gardens. Our medium and long term plans, aim to create jobs in protected conditions for actively supporting social inclusion of vulnerable people. 31 people, representatives of local authorities, NGOs and institutions and people interested in supporting our activities of horticulture, responded to the invitation to attend the "The social economy promoting and partnerships development seminar" that we held in April 2016. The seminar provided an excellent opportunity for dialogue between stakeholders interested in the social economy domain: social service providers, representatives of business sector and government, people in the community. We were pleased to receive assurances from several participants on the interest to buy vegetables that we are preparing to sell and ASSOC Baia Mare association made us a proposal to develop a partnership to buy products that we won’t be able to sell individual customers locally. On the basis of individual needs assessment, the beneficiaries, homeless people, were involved in horticultural therapy program implemented in the gardens and greenhouses created within this project. They worked on a wide range of therapeutic targets: increasing the level of patience, tolerance, balance, fine motoric coordination, learning new information, completing the task, problem solving, sequencing, memory, planning, punctuality, assuming responsibility, socialization, communication, empathy, teamwork, degree of relaxation and joy to spend time actively. 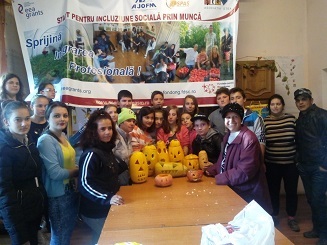 Based on individual development plans, they were involved in a daily activity program that began with a meeting of the group ensuring practical and psychological preparation for the rest of the program and continued with 2 to 4 hours of practical gardening activities depending on the season. Practically every beneficiary was involved in a therapeutic cycle that has 4 main steps shown in the chart below. Training and life skills development are main ways of promoting knowledge, skills and attitudes necessary for young people to manage themselves. The 47 homeless people involved in the project had the opportunity to develop life skills and learn in an open environment based on collaboration, teamwork and promotion of pro-social attitudes. The weekly program sustained their involvement in a process of personal development, social and health-centered learning for acquiring knowledge, skills and attitudes that enable them to live safely, healthily and responsibly as valued members of society. The program was focused on four components related to skills development: social, emotional, cognitive and behavioral level. It included subtasks based on new methods of learning: debate in groups and pairs, role playing, watching educational videos and commenting on the subjects, graphic expression, imagining situations, arguing, brainstorming, etc. The life skills development program has supported beneficiaries in addressing various personal and social problems, helping them to realize their own attitudes towards them and identify ways they can solve problems. The program included outreach activities and monthly group counseling organized by a representative of the Employment Agency and individual counseling activities carried out by the social worker from the project team. The topics discussed focused on: information about the labor market and the rights of the employee and the employer, the criteria for choosing a job and vocational counseling, ways of searching for a job, exploration offer training / retraining and services ensured by the Employment Agency for any person seeking a job, apprenticeship contract, supply analysis of vacancies existing in the county, conditions demanded by employers, role of different institutions in facilitating access to labor market, presentation of the events type "job fairs". During the project 26 beneficiaries had several working activities in the local community, mostly as day laborers. French volunteers specialized in ecological agriculture conducted 12 training activities on growing vegetables in the ecological system. The main issues developed were: concepts of health and safety at work; the timing of various types of vegetable crops; ecological concepts within the cultivation of vegetables, herbs and flowers (soil preparation, sowing / Interested in planting, crop maintenance, harvesting); roles and responsibilities of persons who will be involved in horticulture activities; general notions about soil, natural fertilizer, preparing natural solutions against dust mites and fungi (nettle solution nettle, solution of garlic), compost (theory and practice), equipment and tools used in horticulture, general notions of permaculture and how to use the in practice. 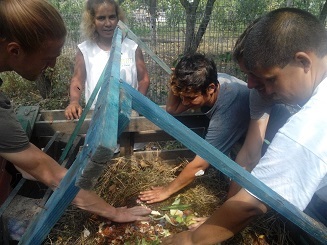 The trainings on vegetable cultivation in ecological ways laid the foundation of theoretical and practical knowledge necessary for the 47 beneficiaries to make practical gardening activities, which represent the central support of the occupational therapy program. Following these activities, the beneficiaries increased their confidence in their abilities to perform gardening activities as an important impetus for motivation to get involved in the program. In November 2015, 20 unemployed beneficiaries started the professional qualification as a worker in plant culture (horticulture and agriculture). The training course was provided by the Employment Agency as the beneficiaries met the criteria specified by the law that provides access to qualification for unemployed people. Training was completed in February 2016 all the 20 beneficiaries obtained the desired professional qualification. 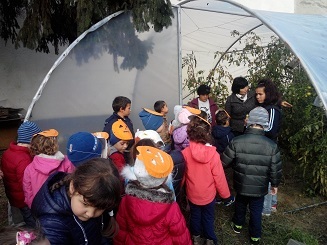 In collaboration with professors / teachers / educators from various educational institutions we have organized 12 visits to Stea Association’s garden and solarium, which have allowed over 222 preschool children and students to learn from the project’s beneficiaries interesting information about growing vegetables. Children could actually see and experience some aspects about growing plants that they have learnt at school only in theory. Under the guidance of the project’s beneficiaries who played the role of "teachers' children participated in several vegetable cultivation and related activities. The actionsof presenting the garden and solarium to children from the local community gave visibility to the project. It also contributed to increasing the self-esteem of the beneficiaries who had an active role presenting their work and observed that their efforts were appreciated and valued by people in the community. This encourages the development of the beneficiaries’ positive attitude towards work. Also this activity contributed to promoting active citizenship among the 222 children and 19 adults who attended our program and it helps rising community awareness to reduce prejudice and negative perceptions about the project’s target group. "The Open Day at Stea’s Garden" organized at the garden with solariums situated in Curtuius area from Satu Mare on the 17-th of September has enabled stakeholders in the community to see the results of the work of the project’s beneficiaries. Progress made by them and greenhouses with different vegetables (tomatoes, cucumbers, peppers, eggplant and green beans) were presented to the 96 guests which attended the event - partners, supporters, volunteers, representatives of local and county authorities, various business people. Direct impact of the discovery of the Stea Garden was high, contributing to enhancing the benefits that our project brings to the local community by increasing the capacity of social inclusion of the project’s beneficiaries. 96 people from the Satu Mare’s community (representatives of local authorities, partners, representatives of institutions and local NGOs, the media, employees, businessmen, volunteers and other stakeholders in the community) direct participants at the event were informed about the project and motivated to sustain it. 9 volunteers recruiting actions made within educational institutions in Satu Mare and an association of retired people, attended by a total of 201 students and adults, have contributed to promote active citizenship and to raise awareness of people from the community about the benefits of volunteering. These action also contributed to promote antidiscrimination of vulnerable groups by highlighting the efforts and results achieved by the beneficiaries towards social integration and their need for support from community. This project represented an important opportunity for change for homeless people who want to integrate into society by empowering and guiding them through a process of evolution from being a person who depends on the mercy and the help of those around his, to becoming the person who works and contributes to the well-functioning of society. We thank our partners, the City Council of Satu Mare, volunteers, media and various resource persons who helped us within this project. We are proud of the results we achieved through horticulture therapy program. It provides customized answer to beneficiaries' needs and empowers them to succeed to change their lives, realizing concrete steps towards socio-professional integration. We still need the support of the entire community to support the social economy activities which we will launch this year to become sustainable and provide stable jobs for marginalized people who are prepared and are working for their social integration.